Terry Pratchett is an English author of fantasy fiction, most well known for the Discworld series which now spans over forty novels in its own right. The Discworld In the 1990s he was the UK's best-selling author, and has sold over 85 million books in 37 languages. In 1998 he was awarded an OBE and in 2009 in he was knighted for his services to literature, which I am sure he took with comic humour to the pomp and ceremony. Perhaps more to his liking, he received the World Fantasy Award for Life Achievement in 2010. In late 2007 he announced that he was suffering from early onset Alzheimer's disease, and just a few days ago he had to pull out from his planned attendance as guest to the International Discworld Convention, stating "the Embuggerance is finally catching up with me". Terry Pratchett's 'Small Gods' is the thirteenth novel in the Discworld series, published in 1992. The fantasy Discworld is a flatworld, balanced on the backs of four elephants, which in turn stand on the back of a giant turtle. It tells the story of the God Om, and his prophet and reformer, Brutha. Om has decided to become manifest in the world, as the time of the eighth prophet is due in a land famous for the many ways that it tortures heretics and unbelievers, especially those who claim "The Turtle Moves!". However, Om appears in the form of a tortoise and lacks any powers. The only person who can hear his voice is the illiterate acolyte Brutha, an apparently simple young man with the gift of eidetic memory, absolute timing, and absolute direction, and as a result has been chosen by the head of the Quisition of Omnia, Vorbis. They travel to Ephebe on a diplomatic and religious mission. Ephebe is a land famous for its philosophers, its election of the Tyrant, and slavery that comes with minimum working conditions, weekends, and annual holidays. "Slave is an Ephebian word. In Om we have no word for slave," said Vorbis. "So I understand," said the Tyrant. "I imagine that fish have no word for water." Over time, and still in tortoise form, Om realises that Brutha is the only person left on Discworld who actually still believes in him. All the others either profess belief out of plain habit, or a visceral fear of the Quisition, encapsulated in the phrase "Cuius testiculos habes, habeas cardia et cerebellum" (Which Pratchett translates, for a family audience, "When you have their full attention, their hearts and minds will follow"). Conflict between Om and Ephebe inevitably develops, and before the very heretical Great Library of Ephebe is burned, Brutha uses his ability to learn to read and memorise as many works as possible. Fleeing to a desert Brutha, Om, and an injured Vorbis discover a ruined temple, home to the ghosts of old gods who are no longer believed. On the desert's edge, Vorbis enconters other Omnians, and then proceeds to become ordained as the Eighth Prophet. As Brutha is placed on a heatable bronze turtle to burned for heresy Om is dropped from an eagle's claws onto Vorbis' head. From this event, witnesses begin to sincerely believe in Om again and his powers are regained. Brutha becomes the head of the new church, establishing principles of openness, inclusiveness, and tolerance. You may note some analogues in Pratchett's work to real-world events in this summary. 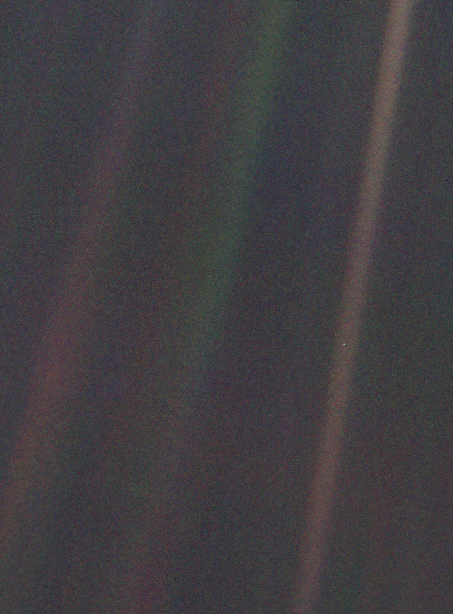 The 'Pale Blue Dot' is a term given by Carl Sagan of a photograph of earth from Voyager 1. This probe was launched in September 1977. In February 1990, having travelled six billion kilometres at a rate of 64,000 kilometres per hour, it had reached the outer edge of the solar system. At this distance, at the request of Sagan, it was turned around and photographed Earth. For Sagan, in his book with that title, the 'pale blue dot' was an image of profound importance and perspective. He writes: "The Earth is a very small stage in a vast cosmic arena. Think of the rivers of blood spilled by all those generals and emperors so that in glory and triumph they could become the momentary masters of a fraction of a dot. Think of the endless cruelties visited by the inhabitants of one corner of this pixel on the scarcely distinguishable inhabitants of some other corner. How frequent their misunderstandings, how eager they are to kill one another, how fervent their hatreds. Our posturings, our imagined self-importance, the delusion that we have some privileged position in the universe, are challenged by this point of pale light. Our planet is a lonely speck in the great enveloping cosmic dark. In our obscurity - in all this vastness - there is no hint that help will come from elsewhere to save us from ourselves." These are fine and powerful words, but from experience some people don't always mentally visualise numbers easily and are assisted by a demonstration. Using an example from the education resources of U.S. National Optical Astronomy Observatory I would like to provide a scale model of the sun; this ball [held aloft] at 11 centimetres in diameter, representing to scale the sun's 1.4 million km. Now with the assistance of a volunteer [Rick, approaches lecturn] please take this and take 13 paces from the lectern. Now hold aloft what I gave you. That's it, that small peppercorn (courtesy of the Willsmere Estate) is Earth to rough scale in size and distance. If I were to get Rick to walk another six hundred paces he would be where Voyager took the "pale blue dot" photograph. But I won't do that; apart from the fact that it's another six hundred paces and we wouldn't see him, Rick would also probably be at the Hilton Hotel on Wellington Parade. That's just our solar system, just one sun. NASA thinks there are two hundred billion suns in our galaxy. 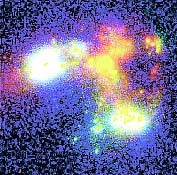 The Hubble Space Telescope has observed 3,000 visible galaxies, and there's no doubt that there's more to come. Of course, this is also just one scale. Also from Carl Sagan is the idea of The Cosmic Calendar, putting the history of the universe to scale in a single year. On this scale the Big Bang took place at the beginning of January 1 at midnight, and now is midnight December 31. There are 438 years per second, 1.58 million years per hour, and 37.8 million years per day. The Sun wasn't formed until the 31st of August, life first appeared on Earth on September 21, the first arthropods on December 14, fish on December 18, amphibians on December 22, reptiles December 23, mammals December 26, primates December 30, and archaic humans thirty six minutes ago. It was only sixteen minutes ago that fire was domesticated, agriculture began a mere twenty eight seconds ago, writing thirteen seconds ago, and all of what we call the modern age, in the last second. In 'The Pale Blue Dot' Sagan argues that from our immediate experience without technological enhancement humans tended to think that our species, the creating, talking, contemplative species, was unique; ".. the most elementary examination of the heavens reveals that we are special. The Universe seems designed for human beings. It is difficult to contemplate these circumstances without experiencing stirrings of pride and reassurance". This sense of phenomenological wonder however transformed from the experiential to the dogmatic and Sagan reminds us of the treatment of those who dared contradict the geocentric view of the universe. Of course the technical tools that proved the Earth orbited the Sun were not available until the last few hundred years, and since then the species has come to the realisation that not only is not the centre of a small universe, but rather just another dot in a very vast universe. Combining both humanism and science, Sagan argues that humanity must both protect Earth from environmental disaster, using transforming technologies if necessary, and make every effort to explore the solar system and beyond for life, and hopefully even conscious life. "Our planet is a lonely speck in the great enveloping cosmic dark", writes Sagan. How likely is it really that within the entire universe exists there is only life here? It is from a sense of perspective of the enormity of the universe, and the deep respect that Sagan has for each and every individual life that leads him to exclaim in frustration. "In some respects, science has far surpassed religion in delivering awe. How is it that hardly any major religion has looked at science and concluded, 'This is better than we thought! The Universe is much bigger than our prophets said, grander, more subtle, more elegant. God must be even greater than we dreamed'? Instead they say, 'No, no, no! My god is a little god, and I want him to stay that way. A religion, old or new, that stressed the magnificence of the Universe as revealed by modern science might be able to draw forth reserves of reverence hardly tapped by the conventional faiths. Sooner or later such a religion will emerge.' I can see a sparkle in the eyes of some members of the congregation: "Oh, do you think that could be us?" The "Little Gods" of Sagan are the "Small Gods" of Pratchett. How many people cling to these deities, be them supernatural or secular? The most pathological and powerful express their madness in the desire for absolute and violent control over a pinprick on a scaled peppercorn for a fragment of a second in the cosmic year. Others less powerful, but perhaps just as pathological if only given the chance, dedicate themselves to acquiring evermore possessions, income, or position. They worship the trivial and the temporal, dedicated to their sporting team, or their political party, or their church, ever more distant from the developing the sense of wonder at the universe, a sense of solidarity with others, and ever more distant from a sense of authenticity with themselves. Now, neither Pratchett or Sagan are theists in the traditional sense, and nor are they atheists like Pratchett's Simony in "Small Gods"; "Gods didn't mind atheists, if they were deep, hot, fiery, atheists like Simony, who spend their whole life hating gods for not existing. That sort of atheism was a rock. It was nearly belief..". Pratchett and Sagan are perhaps naturalistic pantheists (or even panentheist, to be precise in some cases), in the same tradition of minds like Marcus Aurelius, Giordano Bruno, Baruch Spinoza, and Erwin Schrodinger, identifying the immanence of the divine with the universe as a whole, with naturalism, philosophical realism, humility, and reverence. Pratchett explains his own experience, shortly after being diagnosed with Alzheimer's as follows: "There is a rumour going around that I have found God. I think this is unlikely because I have enough difficulty finding my keys, and there is empirical evidence that they exist. But it is true that in an interview I gave recently I did describe a sudden, distinct feeling I had one hectic day that everything I was doing was right and things were happening as they should... It's that moment, that brief epiphany when the universe opens up and shows us something, and in that instant we get just a sense of an order greater than Heaven.... It doesn't require worship, but, I think, rewards intelligence, observation and enquiring minds. I don't think I've found God, but I may have seen where gods come from." For his part Carl Sagan reminds of a responsibility, opportunity, and risk in our technological age, "Our science and our technology have posed us a profound question. Will we learn to use these tools with wisdom and foresight before it's too late? ... That same rocket and nuclear and computer technology that sends our ships past the farthest known planet can also be used to destroy our global civilization. Exactly the same technology can be used for good and for evil. It is as if there were a God who said to us, 'I set before you two ways: You can use your technology to destroy yourselves or to carry you to the planets and the stars. It's up to you.'" There are those religious dogmatists who cling to a credo from a mythological past, who have single, revealed, eternal, and unchanging Holy Books, who have Chosen People, who have doctrines of what we can or cannot eat, or whom cannot sleep with whom, who invoke barbaric punishments to non-believers, heretics, and infidels. Such a conceit that they some special knowledge and information that allows them to speak for God. Faced with the wonders and the immensity of the universe, and the moral challenges of suffering on the planet, do they apply practical wisdom in their faith, and seek the best possible teaching and guidance? No, their God is a small God, a little God. A petty, mean-spirited, vindictive, and dogmatic figment of the past, frozen in time, and frozen in knowledge. They excuse their turpitude and ignorance with the pretense of divinity. Those of greater minds and humbler spirits are faced with the conflicting emotions of contempt and pity, when confronted by those who claim "God will judge you", when really what they mean is "I don't like or understand this". There are so many worshipers of these small gods on this pale blue dot. Their continued prevalence is a threat, increasingly so, even to all life on this planet. It is our responsibility - and indeed our only hope - to engage in a religious conversion of sorts, to show them the immensity and magnificence of the universe as it really is, and what could be done to help and transform life on the only planet that we can call 'home'.